This article is being developed as part of the Skyrim Houses Redesign Project. If you see this tag it means the article can still be improved. Please see the project page for guidelines. 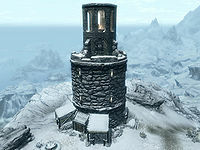 Frostflow Lighthouse is a lighthouse located west of Winterhold in the north of Skyrim. It is home to a Redguard family who recently bought the lighthouse, it was a long time dream for Habd and his wife, Ramati, however Sudi and Mani their children weren't as keen on the move. 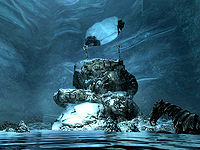 Frostflow Abyss: Uncover the tragic events inside Frostflow Lighthouse. It is located on a headland overlooking the coastline between Dawnstar and Winterhold. It is southeast of an Imperial camp and southwest of Hob's Fall Cave. As you approach the lighthouse you will encounter a dead horse lying on the path near the entrance, while in front of the entrance is a cart with two bear traps concealed underneath it. There are also a couple of snowberry bushes around the building, a covered well near a single stalled stable and a small vegetable patch containing six leeks and four potato plants. There is a small novice-locked shed on the side of the lighthouse. It contains a pickaxe on the left and a set of shelves on the right holding potion of minor stamina, two leather strips, a potion of minor healing, a potion of strength and a quiver of iron arrows. There is also a large coin purse on top. As soon as you enter the lighthouse you will see that something is very wrong. There are blood splatters on the floor and the circular room in front of you has been turned upside-down with a human corpse and the body of a dead chaurus. On either side of you are wooden doors; one is expert-locked, while the other is master-locked. You can hear another chaurus moving around nearby. As you approach the body of Ramati a quest will initiate; to find the source of the murders. Ramati is carrying Habd's journal and has a Falmer war axe sticking out of her. There are six bottles of Nord mead on the floor next to a chair. Against the wall to the northwest is a large fireplace with a cooking pot in front and the body of a chaurus beside it with a woodcutter's axe sticking out of it. There is a bottle of Nord mead on the floor, while on the mantlepiece is a torchbug in a jar, a burial urn and a steel dagger. Inside the urn is the key which opens the master-locked cellar door. If you read the family's journals (see notes) they will lead you to the location of this key. There are two open doors leading to two bedroom from this room. In the middle of the room near Ramati's body is a broken table and three over-turned chairs with three baked potatoes and three salmon steaks now on the floor. Against the east wall is a sideboard with a basket containing potatoes underneath and a salmon steak, two salt piles and three fillets of salmon meat on top. Above the sideboard, hanging from the ceiling are two racks holding a rabbit, three salmon, a bunch of dried elves ear and a garlic braid. To the right is a wooden table with three gold coins on top. Against the wall to the southwest is a cupboard holding clutter with a bottle of Nord mead on top. The bedroom on the left contains two unowned single beds; one in the western corner that appears to have been Sudi's and the other in the eastern corner that must have been Mani's. Between these are two sets of shelves back-to-back. Under Sudi's bed is a medium coin purse and a copy of Immortal Blood. On the shelves facing the bed are ten purple mountain flowers, a set of clothes, two pairs of boots, a small coin purse, a silver necklace, an amethyst and two common books. Beside the shelves is a small square wooden table with Sudi's journal on top. Under Mani's bed is a knapsack and a bottle of Nord mead. Inside the knapsack are a few potions of minor healing, a letter to his sister explaining that he is leaving as soon as father returns, a random ring, some raw food, a set of Hammerfell garb and a common book. On his set of shelves is a set of common clothes, a pair of boots, an iron war axe and a troll skull. There is also a dresser against the southeast wall containing more clothes. The bedroom on the right contains an unowned double bed coming out from the northeast wall, with an end table on either side. The one on the left has Ramati's journal on top, while the one on the right has two common books on top. Behind the door, against the southeast wall is a dresser with a copy of the Restoration skill book Mystery of Talara, v 2 along with a common book on top. Against the northwest wall is a table with two common books and seven gold coins on top and beside this is a cupboard holding some clothes, a potion of healing, two potions of resist cold and a bottle of Honningbrew mead. To the right, against the northeast wall is a small set of shelves holding various clothes, hats and boots. The expert-locked door to the northwest opens to reveal a flight of stairs leading up. At the top there are several bales of straw, a large pile of firewood and a ladder leading to the lighthouse's exterior and brazier. Outside, there is a large locked chest that cannot be picked, it requires a key and another ladder leading up to the side of the brazier to allow it to be lit. Back inside, the master-locked door to the east opens at the top of stairs leading down to the cellar. there is a bear trap half way down the stairs beside a pile of food sacks. At the bottom there are plenty more blood splatters on the floor and a large pile of firewood with a woodcutter's axe beside it. Two chaurus are wandering around the cellar and by a stone pillar are two fish barrels with an iron dagger on one of them and a pole suspended between this and the next pillar holding four whole salmon. Against the outer wall to the southwest is a pile of crates and a couple of barrels, with a potion of minor healing and an iron dagger under a basket on a crate with a pickaxe on the ground beside them. On the far side of the second pillar is an adept-locked chest containing minor loot. Continuing around the cellar's outer wall, to the south is a tanning rack and to the left a set of shelves holding a bear pelt on top, some clothes and a sack of food. Further left, past a food barrel is a second set of shelves holding more clothes, more food sacks and a potion of minor magicka. To the left of this is a pile of crates and left again are a couple of knocked over cupboards with a hole where the Falmer broke through. To the left of the hole, against the internal wall are a pile of straw bales, some crates with two lockpicks on top and two more suspended poles holding a total of eight whole salmon. Exiting the cellar through the hole dug by the Falmer, there is a Falmer war axe on the ground to the right and after a few paces you proceed to Frostflow Abyss. The abyss contains Falmer, chaurus, frostbite spiders and if you have Dawnguard installed, you will also have to deal with a few leveled chaurus hunters that are hidden in cocoons. The abyss has high numbers of both chaurus egg sacs and glowing mushrooms available, totaling up to 516 egg sacs and 93 mushrooms that can be harvested. You continue descending an icy tunnel, at the bottom are blood splatters on the ground and the passage opens out into a cavern with two Falmer tents opposite, the one on the right contains a leveled Falmer magic-user. Either side of the tunnel you are exiting are stacks of crates, an empty chest and barrels. On a crate to the left are five gold coins with a random potion of stamina beside it. Between the stacks is a bear pelt on the ground, while off to the right is a chaurus near a gated exit, a Falmer sword on the ground and in the corner a knapsack. Around the corner to the left is a third Falmer tent, which contains a random potion of magicka. The next tent is empty, while between the first two tents is the body of Mani pierced by a Falmer sword and laying on a flat-topped rock with fires by his head and feet. The third tent has a small fire in front and only contains the Falmer magic-user. Just before the exit lies a knapsack in the southwest corner. The exit is through the gate to the right. Beyond the passage climbs, at the top is a turn to the northeast with nine patches of white cap fungus at the corner. It then opens up into a cave with a Falmer and chaurus. In this area there are several flat-topped rocks with various items on top. On the first rock on the left are three random poisons, two loose chaurus eggs, a bowl of troll fat, a sample of ice wraith teeth, a sample of glowing mushrooms, a nightshade flower and two random potions of healing. On a rock by the east wall are two Falmer war axes, a Falmer shield, a Falmer bow, and two pieces of chaurus chitin. On a rock beside the wall to the southeast is a dead chaurus and a piece of chaurus chitin. To the southwest is a passage marked by a lit torch thrust into the snow on the right. Take care as there is a tripwire that triggers a claw trap from above. At the next corner the passage turns northwest and opens into a cave with a Falmer tent opposite and cobwebs and spider egg sacs to the right. Inside the tent is a leveled Falmer and two frostbite spiders are off to the right. The passage exits this cave to the southwest, in front of the tent. The next turn is to the southwest and there is a two tiered cavern ahead containing two leveled Falmer and a leveled chaurus. One of the Falmer is standing at the front of the ledge above, while the other is further back out of sight and the chaurus is on the ground level behind the pillar in front. There is a Falmer tent on the left with a couple of loose chaurus eggs on the ground in front, a novice-locked Falmer chest and two loose skeever tails inside. Opposite the tent against the west wall is a pen with a closed gate, behind this is the body of Sudi with a scrawled page and a bloodstained note on the ground beside her along with a lit torch. It is implied by the note that she used her dagger to kill herself rather than letting herself be eaten alive. Under the ledge is a pillar with a chaurus hidden behind it. On the right is a caved-in section with gaps you can look through into a cavern further ahead. The passage continues to the southeast. As it climbs you pass through another mushroom farm with several patches of white cap fungus. It brings you out on the ledge above where there are three Falmer tents. The first on the right contains an apprentice-locked Falmer chest. The second is empty and has several more white cap fungus patches and a Falmer war axe to the left. The third is to the left and contain four loose chaurus eggs, a Falmer sword and shield. To the west is a ledge you will need to drop down to continue. Your follower (if you have one with you) may not jump down, but instead wait for you on the higher level. To prevent this, you can nudge them over the edge by running into them or using the Unrelenting Force dragon shout. There is another Falmer tent on the right and a leveled chaurus in front. Once you descend you will have no way of returning back the way you came and will have no choice but to continue. The tent contains a Falmer bow, two random potions of healing and a random poison. This is the area you could see through the cave-in. There is an unlocked chest behind the tent and the passage continues to the northwest. After a short distance the passage turns again to the southwest by some more white cap fungus patches and after a few paces ends at another ledge with two chaurus below you among many chaurus egg sacs. The cavern at the bottom has shallow water covering the floor and a passage leading northwest. Following this to the next cavern where two chaurus, at least one of which is leveled and several chaurus cocoons are among many more chaurus egg sacs. There is a ledge at the rear of the cavern and the passage exits to the north. At the end is a ledge you have to drop down again into a final huge cavern with three chaurus nearby and several more coccoons around the area. To the northeast is the biggest chaurus reaper you will have seen along with a couple of smaller ones. This is the final battle. Inside the reaper are Habd's remains and a key which unlocks the chest found at the top of the lighthouse. There is an earthen ramp climbing up to the left, it then follows the cavern walls and loops around the cavern counterclockwise. Near the top are two more empty Falmer tents and an unlocked boss leveled chest to the right of a final passage heading northeast to a drop that brings you back to the first cavern by the knapsack. Take his remains up to the brazier at the top of the lighthouse to gain the active effect Sailor's Repose, which makes healing spells stronger by curing 10% more. There is a corundum ore vein northeast of the lighthouse. Habd's journal can be found on the corpse of his wife, Ramati. Sudi's journal can be found on a table in the room to the left. Ramati's journal can be found on an end table in the room to the right. Mani's letter can be found in the knapsack in the room to the left, mentioning his intention to leave. If you have a follower with you, they may give the "approaching a cave" dialogue due to the lighthouse having the keyword "dungeon". This page was last modified on 5 November 2017, at 20:47.